Please contact boat owner Kevin at 605-661-4018. An absolute classic. 1958 Chris Craft "Cadet". 25 feet wtwin Hercules 6 cylinders. Hull 21 of 72 built. I have owned the boat since 1990 and have done extensive research and have found not another in the water. The closest I came was via description, was on poles at a boat works out East. This is a boat that draws attention. Whether you are pulling to your destination, unloading at the boat dockpreferable to keep in a slip, anchored on the water or pulled up to a dockside eatery, people will want to see. 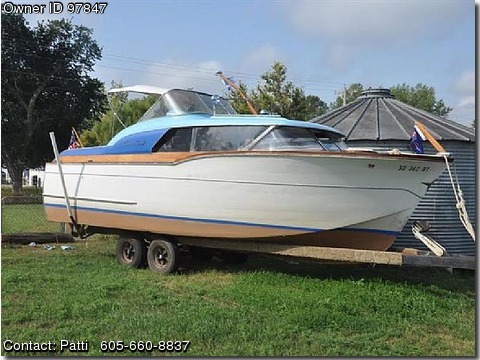 And to know there is not another one like her makes it most special to the owner The story I was told at time of purchase is Chris Craft overbuilt the boat, with it's twin engines and finished interior, a 34' cost the same. 3 years ago Iwe stripped the bottom down to bare wood and re caulked. Last year the port engine was rebuilt top to bottom. The starboard engine was rebuilt in 1999 but was placed in storage for 12 years...so it has very few hours. Almost a year ago now, the inside including the inside cabin and outside deck area was refinished w2 coats of finish applied. We finished the season last year and had "Steve" at Blue Water Restoration winterize and is making some repairs this spring. If you enjoy working with wood you'll love making her shine. The expensive "dirty work" is done. You'll get a big smile on your face when you "Lite up the Twins" and cruise around 35 mph. With it's Clipper Bow" and artistic lines there's much to appreciate.